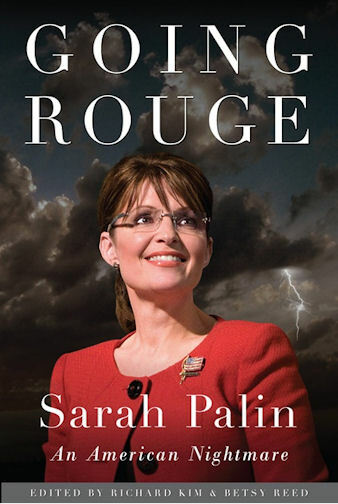 The most honest, revealing account of the Palin story to appear this fall? You betcha! Max Blumenthal, Joe Conason, Eve Ensler, Michelle Goldberg, Jane Hamsher, Christopher Hayes, Jim Hightower, Linda Hirshman, Naomi Klein, Dahlia Lithwick, Amanda Marcotte, Shannyn Moore, John Nichols, Tom Perrotta, Katha Pollitt, Hanna Rosin, Matt Taibbi, Michael Tomasky, Rebecca Traister, Katrina vanden Heuvel, Jessica Valenti, Patricia Williams, JoAnn Wypijewski and Gary Younge. Congratulations on the vision and expediency of these people for getting this book out there and available and congratulations to ORBooks for sticking your neck out there as I’m sure you’ll receive some letters and phone calls from Palin’s pathetic attorneys. Will this outsell the Original? You Betcha’!